Hi lovelies! How are you all doing? 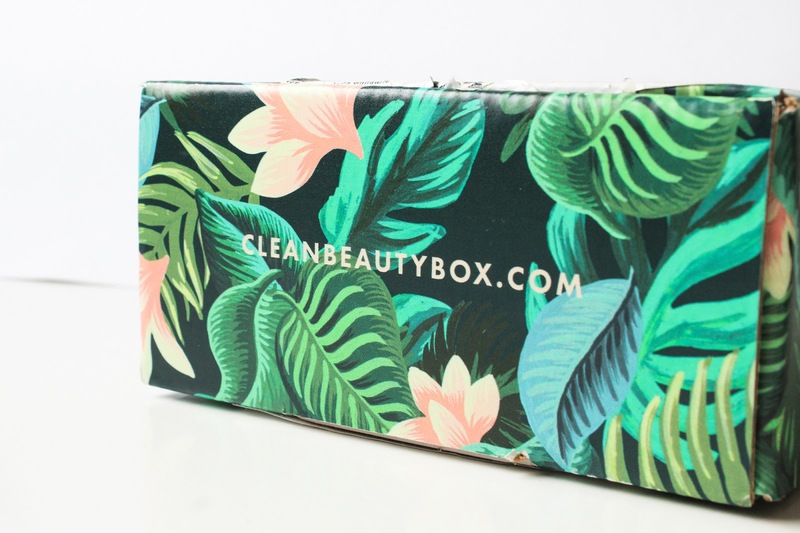 Couple of days ago I received the March Clean Beauty Box* so let me share with you my first impressions and introduce you to a new-to-me brand that I've been really curious to try out. 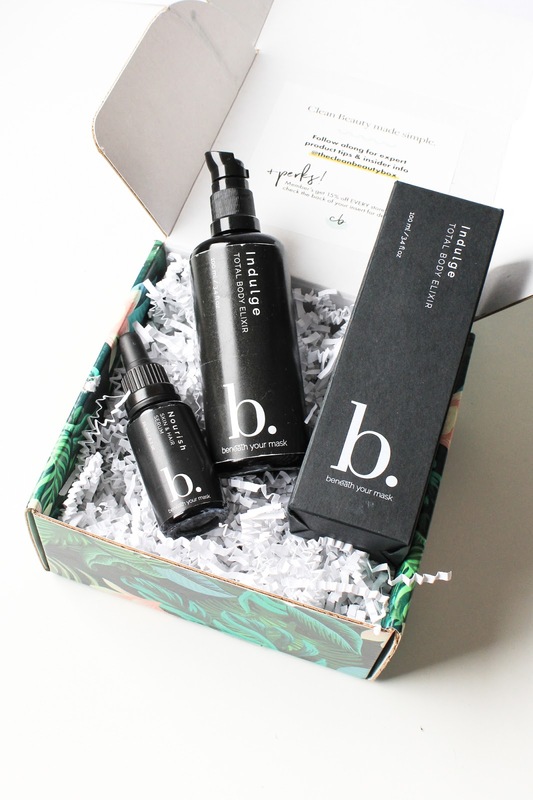 But first a few words about Clean Beauty Box, which was previously known as Art of Organics. Not only that they've gone through a name change, they also changed their packaging. They downsized, minimized the waste and made it more eco-friendly by packaging the goodies in one box only. I'm so happy about that, I think this was a very good decision. 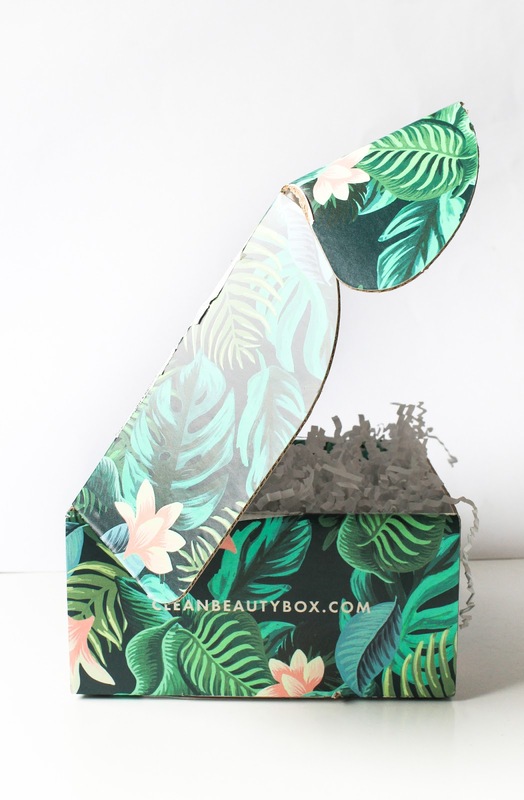 So before we got a box of products in another box and now there's just the one box which you can see looks gorgeous. This month's print is utterly stunning - it was created by Fox & Follow, check them out on Instagram at @foxandfallow here. I have to say that it's really fun to see the print on the outside of the box. I bet at least one person working at the post office thought it's cute. It definitely catches your eye! I guess this is good marketing, wouldn't you say so? 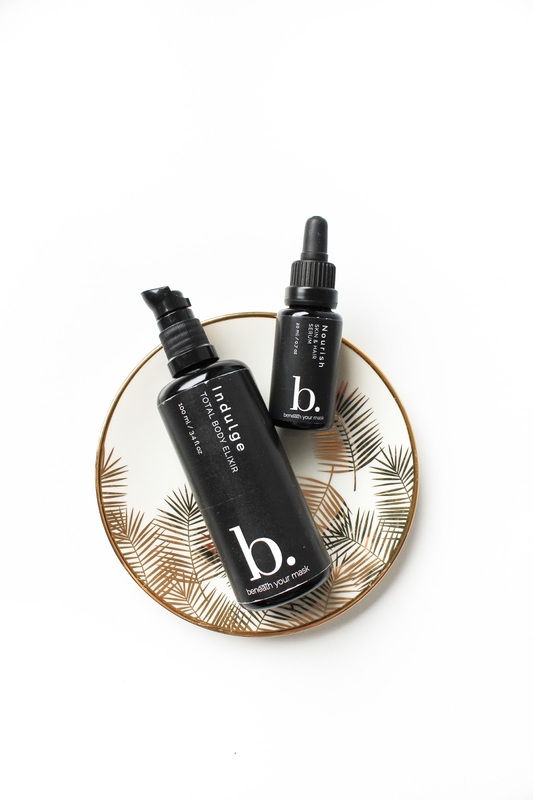 In the March Clean Beauty Box* are two products from Beneath Your Mask: Indulge Total Body Elixir (full size) and Nourish Skin + Hair Serum (20 ml). Check out the box here. Since I haven't tried Beneath Your Mask before let me quickly share some information about the brand. Beneath Your Mask was founded by Dana Jackson who after being diagnosed with Lupus and Lupus Nephritis, started to look for products that would help her skin and hair, and was inspired to make her own beauty products. I encourage you to read Dana's story here, what a journey and transformation. Beneath Your Mask strives to create pure, luxurious, all-natural products loaded with tons of healing ingredients that appeal to all your senses. They’ve sourced the world’s most potent, organic, and wild-crafted botanicals from 25 countries, each chosen for its restorative benefits. Their products are highly concentrated and do not contain any water, phosphates, parabens, sulfates, gluten, toxins, GMOs, or synthetic colors and fragrances. Their products are hand-crafted with love in small batches and sealed in violet-colored glass packaging that harnesses specific light rays to increase the energy level of each product. 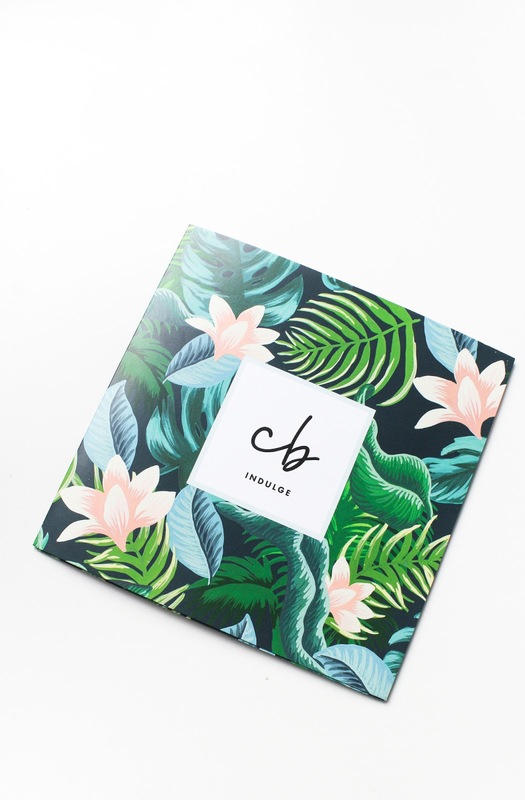 Beneath Your Mask currently offers five skincare products and as I said, you get two of them in the March Clean Beauty Box. Indulge Total Body Elixir is a luxurious body oil, formulated to match skin's natural lipid balance. This fast absorbing blend promotes healing and rejuvenation, deeply nourishes, and protects from the elements. 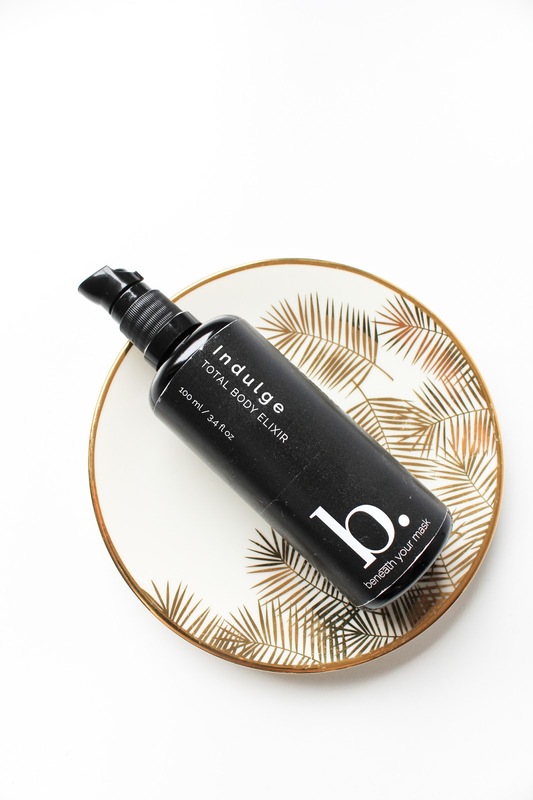 Indulge contains 18 pure plant oils and botanicals such as Sunflower, Baobab, Grapeseed, white Camellia, Golden Jojoba, Sea Buckthorn. I'm having a bit of a hard time describing the scent - I mostly smell Ylang Ylang but it's not straight up sweet and floral like ylang ylang. It's much more complex. I can't figure out the undertone but I think I can smell a little bit of Geranium and Myrrh. Besides the three essential oils you will also find Lavender, Grapefruit and Lemongrass. I like the scent but I'm not in love with it, at least not yet. I'm so strange with scents sometimes. I either get used to it or I leave the product and come back to it at a later time and then I suddenly love its aroma (even tho I didn't care for it at the beginning). But anyways, the body oil absorbs quickly into the skin leaving it moisturized and soft. You can check out Beneath Your Mask Indulge Total Body Elixir here. Nourish Skin + Hair Serum is "the most comprehensive serum ever created, this blend is extremely effective at balancing moisture levels & restoring elasticity to skin and hair while protecting them from environmental stressors." 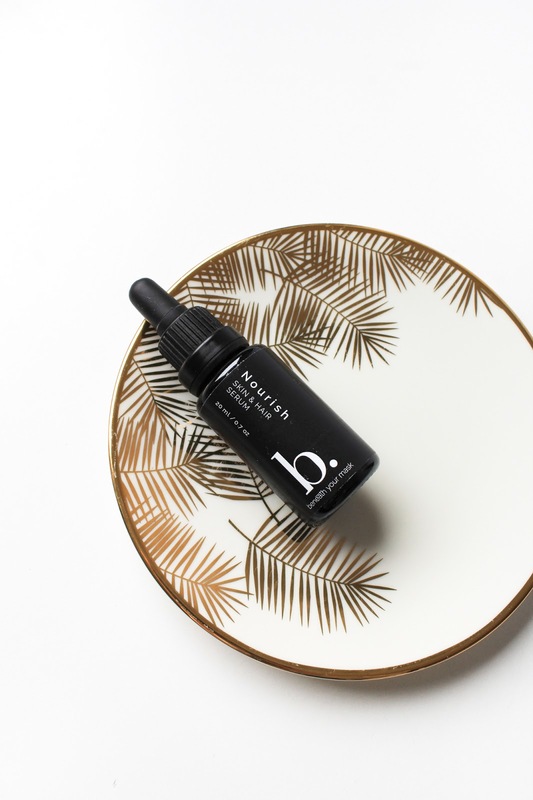 This serum is designed for skin and hair, and is supercharged with a potent cocktail of pure plant and essential oils such as Hemp, Safflower, Rosehip, Macadamia, Pomegranate and Neem. It has a strong scent of Lemongrass but there's also Lavender, Tea Tree, Peppermint, Thyme and a few more essential oils. The oil is very emollient and quite lightweight. I've tried it both on my face and my hair and I liked it. Because it has quite a strong scent I think I will mainly use it as an overnight hair & scalp treatment. You can get Beneath Your Mask Nourish Skin + Hair Serum here. 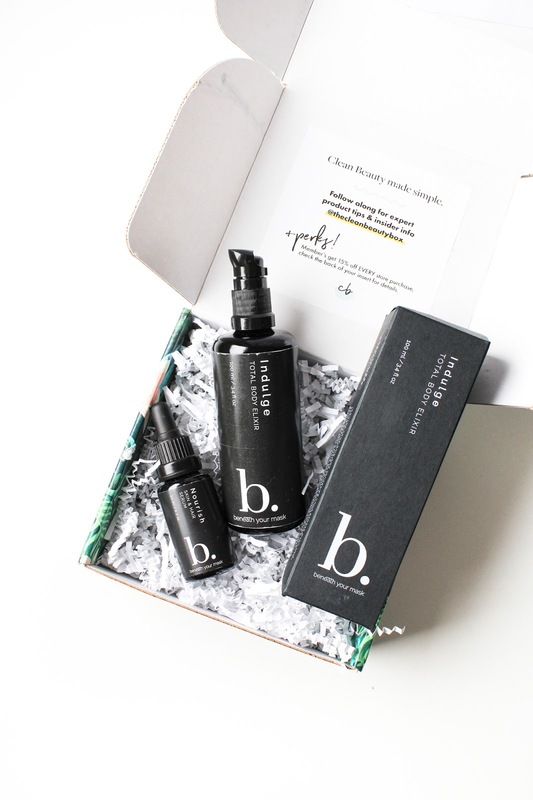 You can get March Clean Beauty Box featuring Beneath Your Mask products here.